Study at the ICN Business School in Nancy, France. The program is intended for students studying business and economics. The exchange program started in fall 2008 between CSUN and the ICN Business School. This program aims at facilitating international experiences and cross-borders learning for students and faculty members. 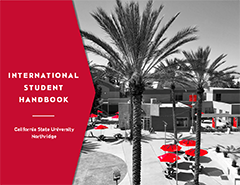 It is one of the many exchange programs that CSUN has developed with universities all over the world. Students staying a year at ICN have the opportunity to obtain a bachelor’s in business administration (BBA) from ICN in addition to their business area or economics degree from CSUN. Duration of exchange: Students may participate in the program for either one semester (fall or spring) or for one academic year. Only those students participating in the all year option obtain a bachelor's of business administration from ICN. Approximate living expenses are €12,500 per year and €6,500 per semester based on accommodation and living expenses of €900 per month. ICN does not provide accommodations but assists students in finding different types of accommodation, including furnished studios in private residences (€300-€400 per month), furnished rooms in state-owned university residences (€150-€350 per month) and private housing (prices vary). There is a pick-up service at the Nancy train station by the student association Globe And Co. Students must give 48-hours notice for this service. Any academic credits received during the course of the program may be transferred to CSUN as pre-approved by the academic department. French system is based on European Credit Transfer and Accumulation System (ECTS), which is a standard for comparing the study attainment and performance of students of higher education across the European Union and other collaborating European countries. ECTS credits are awarded for successfully completed studies. Applicants must have a cumulative overall grade point average of 3.0 or higher and must have completed a minimum of 60 units (junior standing) at CSUN (for transfer students) and must be a CSUN undergraduate student with a business or economics major at the time of application. Students must also have completed all lower division requirements and BUS 302 AND BUS 302L with a grade of CR. Click here to get started on you CBEP: France application! For program and application information, please make an appointment with Eleanor Wolgast by emailing study.abroad@csun.edu or by visiting the International and Exchange Student Center.